In Kuchh Bheege Alfaaz (KBA) the traditional tearfulness associated with the emotions of hurt, pain, betrayal,isolation and guilt—yes, all of these emotions are compressed into Onir’s latest—are alchemized into a warm-hearted frothy but never frivolous look at how craggily man-woman relationships pan out in the city. Onir shoots his love stories in the pitiless heart-land where he succeeds in ferreting out a bedrock of compassion while his protagonists, melancholic but smiling misfits of the metropolis, struggle with their isolation and suffering. In KBA, Alfaaz suffers in abundance for a guilty secret that he harbours from his teens. It’s Alfaaz’s good fortune that his misfortune is portrayed by an abundantly emotive new actor. Zain Khan Durrani is most decidedly a prized find. His command over his character’s dithering emotional graph isnimpressive. His command over the Urdu language and the sher-o-shayari that his RJ’s character is insistently required to spill into the scanty screenplay, is even more impressive, especially in today’s cinema where our heroes “think” in English. 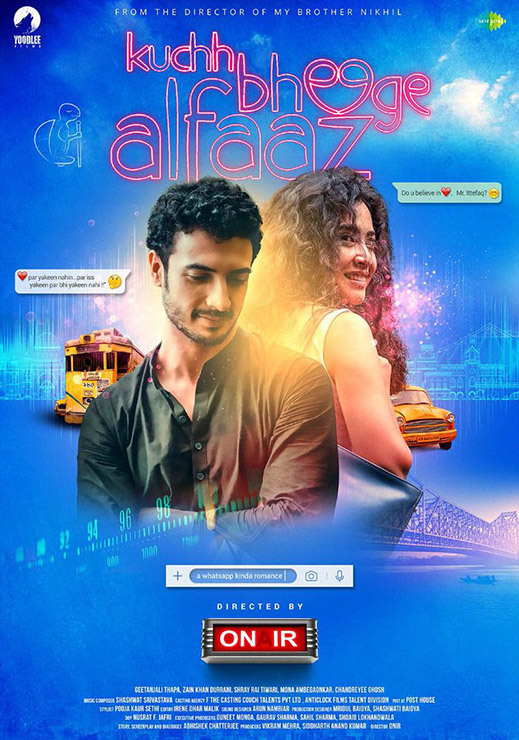 Zain with his restrained ruminative romanticism, makes you overlook the film’s bleaker bits , the repetitive use of the whatsapp theme to drive in the point of how contemporary relationships are driven in to the zone of tenability on the Smartphone. After a point those pings on the screen just begin to seem annoying. The lead pair keeps our attention from flagging. If Zain is every bit the dreamy RJ with a nightmare tucked in his heart, Geetanjali Thapa (so brilliant in the unreleased Liars Dice) as the sunshine girl with a skin ailment, gets into the skin of her character, though some of the script’s attempts to scrub her conscience clean of all self-pity is way too tactless (a blind date who keeps digging his nose, for example, hardly makes for a convincing case of self-worth for the girl with the skin ailment). Zain and Thapar keep us watching. Zain’s voice playing across the radio waves gives the narrative a romantic heft that the film may have otherwise lacked. The supporting cast is also well-woven into the script. Mona Ambegaonkar as Thapa’s feisty mother and Shrey Rai Tiwari as Thapa’s best friend with a nosy mother serve potentially hackneyed roles with an empathy that goes a long into making the core romance convincing at times even sublime. The film’s Kolkata locations are solidly shot by Nusrat Jafri to capture a city trapped between an evaporating traditional edifice and a rapidly developing urbanization. Significantly Kuch Bheege Alfaaz ends not in Kolkata but scenic silent serene Simla with the film’s most memorable moment of empathy where Zain’s Alfaaz is shown resting his weary guilt-ridden head on the shoulder of a grandfatherly figure. The moment expresses a stirring mix of regret and hope, the kind of emotional synthesis that we rarely get in today’s cinema. 16 queries in 1.259 seconds.